Home > Money Clips > Valentines's Gift Silver Dollar Money Clip. Handmade Money Clip with Coin. 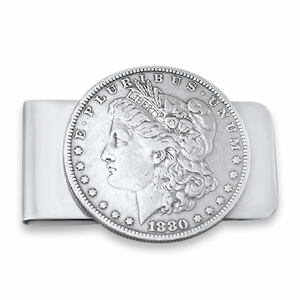 Morgan Dollar Money Clip. Silver Dollar Money Clip. Unique Money Clip. This beautiful Silver Dollar is set on a strong nickel money clip base guaranteed to hold it snap for years. This coin jewelry money clip can be made from your coin for $20. This handcrafted coin jewelry money clip is also made in the USA.